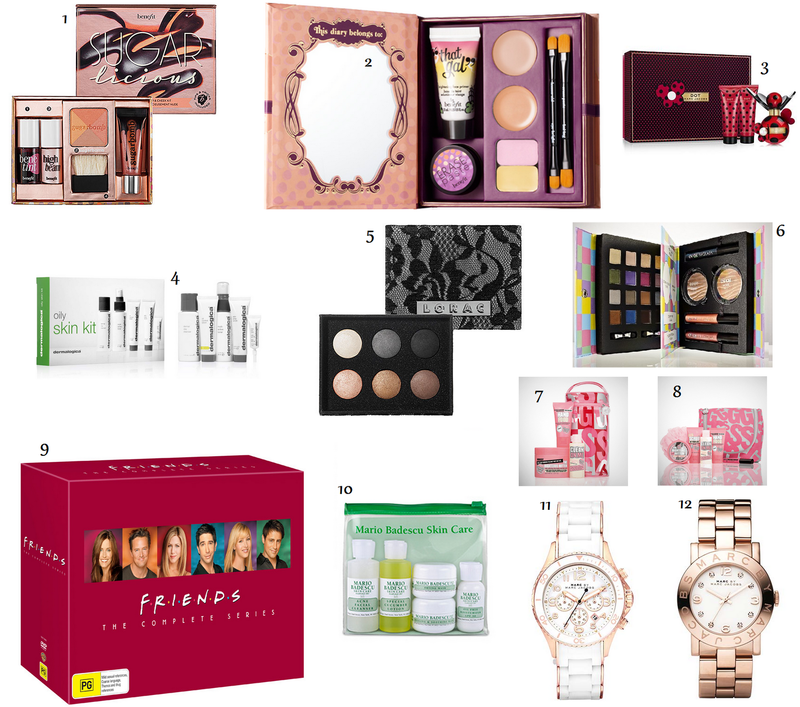 So with Christmas time getting closer I have seen so many of these Christmas gift ideas and wishlist & I LOVE reading all of them so I thought I would share some of the things I'm hoping to find under my Christmas Tree :) All these Items are either sold in Australia or can be shipped to Australia. Who doesn't want something from benefits gift set range. I've always wanted to try Sugar Bomb Blush so i think this would be a really cool way of trying it out with all the other extra's in there. I've also always wanted to try erase paste by Benefit and I just love the look of this kit. I don't have a large collection of perfumes I only have around 2 at a time as I tend to find a scent I love and stick with it but this looks like such a nice bottle I would love to give this a try & I do love Marc Jacobs Perfumes. I love Chi Chi make up it's so cute and this set is no exception. A lot of the stuff on my wish list is stuff I've read about but never used and I love how around Christmas time all these brands do such amazing gift sets & they are great ways to try out new brands and things you've never tried before. I love TV shows and the amount of them I own on DVD is insane but somehow I don't own Friends and it is by far one of my Favourite TV Shows Ever. Another thing I've always wanted to try is Mario Badescu Skin Care as I have seen & read many great reviews on this stuff & this looks like a nice way to get started. Who can say no to a Marc Jacobs watch. What are you hoping for most this year? Oh, I saw a post recently by a blogger who bought the confessions of a concealaholic from ebay as a factory second. http://aliceboullin.blogspot.com.au/2012/11/benefit-confessions-of-concealaholic.html Thats the link to her blog post, you might want to check it out, its ends up being less that $20!! I love those benefit lip and cheek sets - I'm looking at tropiCORAL because I already have a sugarbomb blush. Dot by Mark Jacobs is a really nice scent(and has the cutest bottle!! ), it's on my wish list along with DNKY fresh blossom be delicious. Friends is one of my favourite TV shows too (they play re-runs so much on TV I can't be bothered buying the DVDs though). I have the enzyme cleanser from Mario Badescu and I really like it so far :D I have no idea what I actually want for Christmas this year! And hi from your newest follower!